Now you can stop wondering what's going on with your electric model and get answers that allow you to apply science to your hobby. The precise measurements you collect will help you fine tune your model to get all the performance that you paid for. Effect of gearing and propeller size and shape on power consumption and battery currents Clever hobbyists will discover new applications to further improve electric model performance. Note 1. This item does not come with a temperature sensor probe and Auxiliary battery probe. 2. 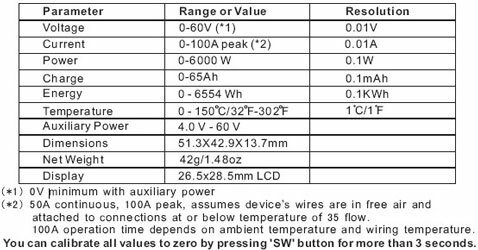 If the input power is below 4V, you should use 4V-60V auxiliary power with Hitec female connector to power up the watt meter. 3. If you need temperature sensor or auxiliary power probe, please email us for lead time. Related Product Please click here to order 4.8V battery with Hitec female connector. Great quality products and shipping speed.